From a datacenter operator or cloud provider point of view, IT services are intangible entities which must run reliably 24/7, be provisioned on demand with the right scale, and be documented and certified properly. In the Service Operations research initiative of the Service Prototyping Lab, we take a closer look at the needs of businesses which operate infrastructure, platform and application software services. There are differences in the structural appearance of services (e.g. daemon, virtual machine, container, plugin archive) and in the level of assurance against risks (technical, legal). These differences need to be accounted for when planning and scheduling the service execution. 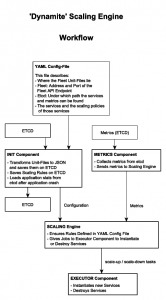 Operation of testbeds for service execution. A BladeCenter is already set up for this purpose. Solving business needs regarding service-level agreements (SLAs), software and process certifications, governance, high availability, failover, as well as further technical protection schemes. IT services are the foundation of all digital processes between individuals, enterprises and organisations. Increasingly, processes are going digital, which saves paper but demands fully reliable and automated IT service delivery and governance. Therefore, this initiative serves as enabler and helps in particular companies to dry-run their services in a controlled environment before rolling them out for the target consumers. Working with remote services requires appropriate and decent tooling. A service idea may take just five seconds (“I want to offer a robust note-taking service”), but its realisation may take much longer (“Which programming language and model?”, “How to describe the service?”, “Where do I find a fitting file service to store the notes on unless I want to take care of backups by myself?”, “Where do I publish my service so that it runs and generates income?”). Therefore, modelling, engineering and integration tools are primarily needed. These tools work in combination with a certain service environment, or ecosystem, consisting of more tools, dependency services, and service platforms which bring services to life. Open source service platforms such as SPACE and FIWARE went from being architectural visions to actually usable platforms. However, in comparison to cloud stacks and commercial cloud services, their popularity is limited and they are far from being used pervasively. 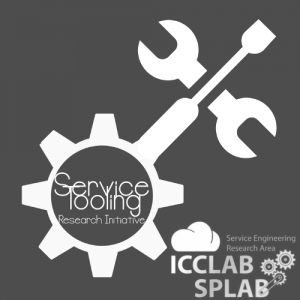 Therefore, the Service Tooling research initiative of the Service Prototyping Lab intends to identify tools and platform services which are straightforward to deploy, easy to use and generic enough to be re-usable in many service scenarios. For this purpose, the initiative follows a triple structure with three topics of increasing industrial and societal interest: Function-as-a-Service (FaaS), Stealth Computing, Cloud Ecosystems. Research and innovation in the entire service lifecycle through advanced tooling: Modelling, publishing, running, consuming and evolving services and service-based applications. This initiative will therefore contribute open source tools to build service platforms, ecosystems and individual applications. Layered architectures for services and clients, including adaptive invocation and stealth data management, to benefit from service and cloud environments while overcoming their limitations. 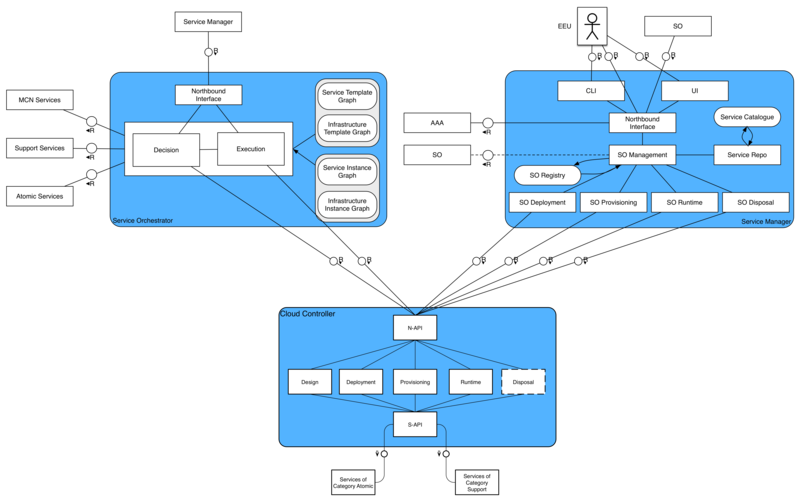 In connection with CNA, identification of suitable tooling for engineering cloud-native applications, in particular aiming at extreme microservices (nanoservices) with FaaS. Adaptation of applications to execution technologies in general: VMs, containers, packages, functions, unikernels. None of these should be a concern to an application engineer and therefore automated tooling is required. 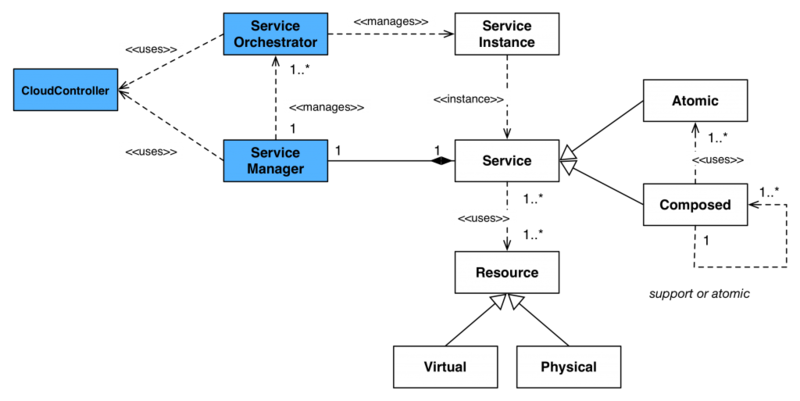 In this part of the initiative, there are a number of architectures depending on the use case and the lifecycle phase of a service. 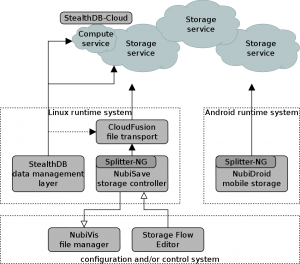 The following diagram represents a typical multi-cloud service integration point with stealth properties. Software applications and services benefit from spreading their data and functions across providers in a tightly controlled, re-usable layer with standard interfaces such as files (e.g. POSIX) and data (e.g. SQL). Users are more willing to adopt cloud environments when explicit user control is made possible by stealth computing. This part of the initiative explores marketplaces, brokers, dashboards, cloud migration tools, API generators, aggregators and other enablers of thriving ecosystems with service producers and consumers. The research focuses on prototyping techniques with description/implementation roundtripping, a library of utility services which aid in establishing ecosystems, and improved client-side tools such as CLI helpers. 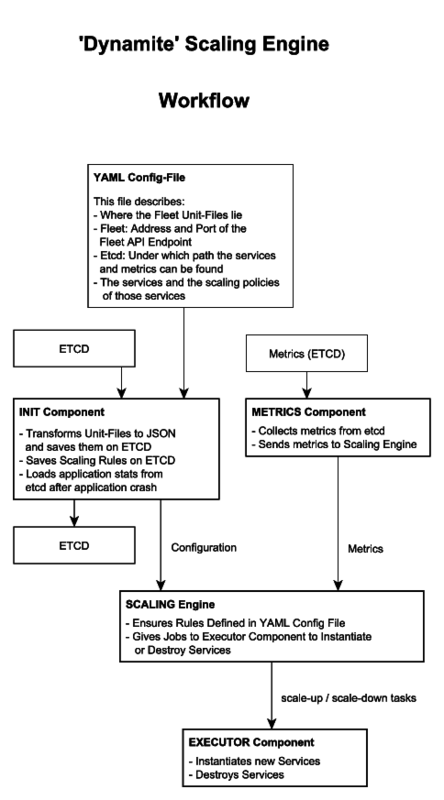 In the FaaS part of the initiative, tools to bring legacy code into FaaS environments as well as tools to advance the environments themselves are investigated. There are software decomposition tools for Python (Lambada) and for Java (Podilizer, Termite). Furthermore, there is a flexible client/server tool to migrate, execute, test and deploy functions written in several languages (Snafu). Note: Preprints are made available in a timely manner. Check preprints. J. Spillner: Secure Distributed Data Stream Analytics in Stealth Applications. 3rd IEEE International Black Sea Conference on Communications and Networking (BlackSeaCom), Constanța, Romania, May 2015. J. Spillner, A. Chaichenko, A. Brito, F. Brasileiro, A. Schill: Cloud Resource Recycling: An Addition of Species to the Zoo of Virtualised, Overlaid, Federated, Multiplexed and Nested Clouds. SDPS Transactions: Journal of Integrated Design and Process Science (JIDPS), vol. 18, no. 1, pp. 5-19, April 2014. J. Spillner, S. Illgen, A. Schill: Engineering Service Level Agreements: A Constrained-Domain and Transformation Approach. 3rd International Conference on Cloud Computing and Services Science (CLOSER), Aachen, Germany, May 2013. Note: Latest posts are on top. Note: The software repositories are hosted in the Service Prototyping Lab Github account. Some of our smaller tools are operated live on a Labsite. Check labsite. Podilizer: Decompose legacy Java code into functions and deploy them into an AWS Lambda environment. Transducer: Service interface transducer for rapid prototyping. Creates a running service mockup from a RAML description. Lambda Control Plane applications: Lambackup & LaMa. Store and process data in the AWS Lambda control plane. Whatcloud: Identification of cloud provider by network location. AWS-CLI-Retry: AWS-CLI tools with retry patches. A wrapper around AWS-CLI for more robustness. now archived: Open Source Service Platform Research Initiative, with further links to the SPACE service platform, spotmarkets, crowdserving portal, π-box for user-controlled access to clouds, nested virtualisation etc. The connection between the physical world and the virtual world has never been as exciting, accessible, and economically viable as today. Sensors, actors and robots are able to deliver many physical services in several scenarios, including industrial production and home automation, elderly care, assisted living, logistics and cooperative maintenance. In isolation, computing capabilities of robots are however limited by embedded CPUs and small on-board storage units. By connecting robots among each other and to cloud computing, cloud storage, and other Internet technologies centered around the benefits of converged infrastructure and shared services, two main advantages can be exploited. First, computation can be outsourced to cloud services leveraging an on-demand pay-per-use elastic model. Second, robots can access a plethora of services complementing their capabilities (e.g., speech analysis, object recognition, knowledge sharing), enabling new complex functionalities and supporting learning. Cloud robotics is a natural extension to the Internet of Things (IoT). Where IoT devices will gather information about an environment to help make smarter decisions, cloud robotics will be able to use this information and act on it. Although there is clear recognition that Cloud access is required to complement robotics computation and enable functionalities needed for robotic tasks (e.g., self-driving cars), it is still unclear how to best support these scenarios. 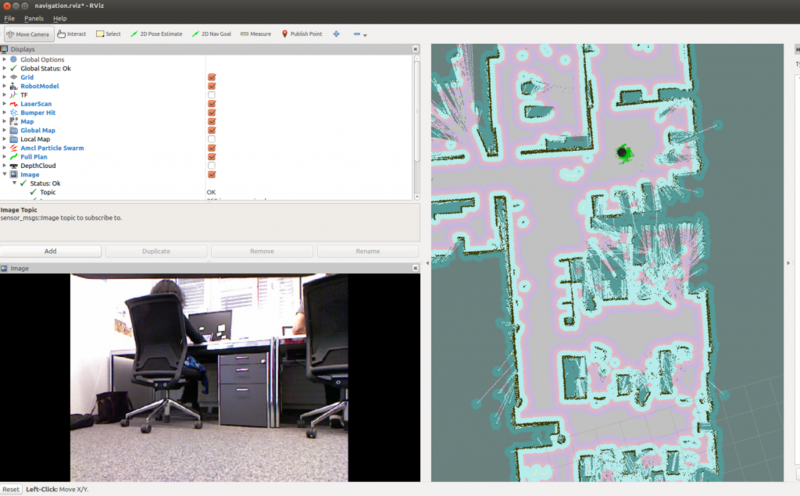 The Robot Operating System (ROS) (http://www.ros.org/) has gained massive traction both in industry and research. ROS allows robotics developers to concentrate on one specific functionality at a time (e.g., planning, navigation, 3d reconstruction) implemented into so-called ROS nodes that can communicate through pub/sub or RPC-like messages to implement a coherent robotic behavior. Its next release iteration (ROS2) will address most of the shortcomings of the previous version, for instance removing the need for a centralized master node and adopting a peer to peer discovery mechanism for nodes. Current ROS development is still faced with low-level interoperability and compilation concerns. Containers in this context are used for the moment simply as a way of providing a consistent running environment for ROS code, however none of the best practices from cloud computing (e.g., resource and container management, placement automation, resource and SW orchestration, continuous integration and deployment) have been adopted yet. The initiative’s goal is to enable robotic applications to take full advantage of cloud computing services, resources, best practices, and automation by integrating ROS nodes and robots just as other composable services in the cloud. End users will benefit from robots and applications that work out of the box and can be easily integrated among themselves and with their favourite cloud services. Cloud orchestration will cover the entire lifecycle of a robotics service, catering for timely resource allocation and dismissal, taking full advantage of the cloud pay-per-use model, sensibly reducing operational costs with respect to an always-on solution. Moreover, by taking a service oriented approach and adopting modern cloud-development methodologies, developers will benefit from continuous integration / deployment practices, resulting in shorter release cycles and higher productivity. Review frameworks for offloading processing and storage tasks into suitable cloud services, including one of the first such frameworks, AdAPtS (2012). Delivery of a bundled set of service tooling, including a dynamic service registry, for the purpose of letting robots access cloud services many years after production despite constant service evolution. Fleet management for robots in the cloud. Collaborative knowledge sharing between robots using suitable online services. Identification of beneficial services to augment robot capabilities, such as image recognition and messaging. Robotics is a hot market with competitive manufacturers especially in Switzerland and Europe, including Rapyuta, Aldebaran and (for educational purposes) LEGO Mindstorms. The much larger and currently mostly untapped market is about robots connected to appropriate feedback-loop and cooperation services. Todays Application developer tooling is focusing on single (mostly monolithic) applications and local development on developer workstations. Modern “Cloud Native Applications” on the other hand are distributed, decoupled, resilient and highly scalable. Sometimes a Business Application consists 20+ so called Microservices. In the cloud age, customers expect fast innovation and a downtime-free application provisioning. Modern cloud development tools, cloud automation and continuous delivery of software as a service makes this possible. This delivery model depends on a continuous service deployment functionality in the hosting environment, i.e. in the PaaS or IaaS stack, in combination with powerful version control systems and automated continuous testing and integration. To bring software to scale and avoid failures, decentralised stacks and systems are used to deploy the services. Once they are deployed, scalability and resilience are taken care of by run-time methods such as CNA. 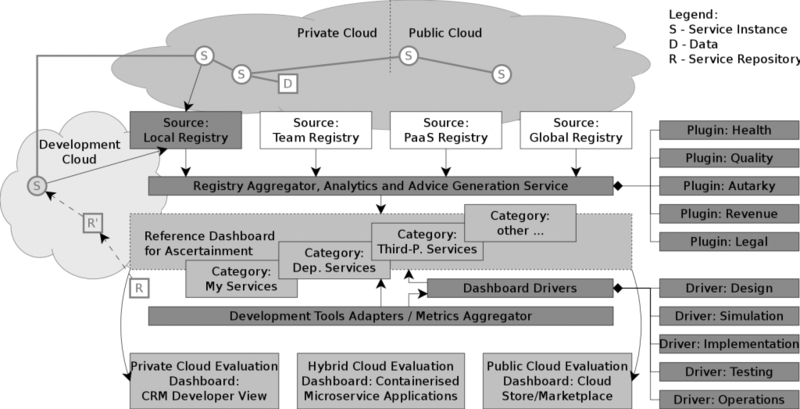 Cloud Application Developer tooling and Continuous deployment on PaaS platforms is a particularly popular research topic with industrial relevance. Tools are being created to support CloudFoundry, OpenShift, Heroku, and Azure. The goal is to get the services running with a single button click and no more worries about dependencies, random breakage or interface incompatibilities. Innovation in the entire application development lifecycle: design, modelling, testing, packaging, deployment, debugging, publishing, running, monitoring. This initiative will therefore contribute open source tools to build application development ecosystems. Provide advanced tooling to develop and operate large and complex cloud application. Enhancing techniques and tools to support multi-stage zero-downtime deployment of complex cloud service systems. Focus on Cloud Native Applications, but also supporting complex scenarios, like service interdependencies, versioning and data migrations. Although there are several continuous deployment approaches and quite a few comparisons, there is a lack of a detailed analysis of how to choose the best techniques for deploying services in cloud environments. The Cloud Application Developer Tooling research initiative of the Service Prototyping Lab is exploring ways to get more knowledge and findings on this topic. Automation is a massive cost cutter in the IT industry. By leveraging modern distributed development technologies, application developers and operators can streamline the application lifecycle, eliminate the downtime, and governing it with a minimum effort required for testing and deployment resources.